The Junior Room brought in their favourite toys for ‘Show and Tell’ this week. There was great excitement in the class room and the children loved listening to all the boys and girls as they showed their toy to the class. Afterwards everyone had the chance to explore each others toys and ask any questions they had. Congratulations to all who take part in the Write a Book project this year. Everyone produced wonderful stories and illustrations for their books. We were very proud to have had 4 winners in our school, Annie, Saoirse, Lydia and Gabrielly. Well done girls, keep up the good work. 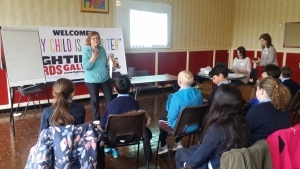 Senior Room attended a writing seminar in Kilcornan and will receive their books soon. The children have been learning all about procedural writing this month- what you do first, next, then and last. The children made rice krispie buns and cookies using this format. Acrostic poems and Free writing stories. The senior infants were busy writing acrostic poems for Mother’s day while the senior room were working hard writing stories about ‘The fairies play a trick on the farmer’. Today the children got the chance to dress up as their favourite book characters and bring in their favourite book to show to the school. The wholeschool came together to show off all the wonderful books, characters and world of literature. The older children read to the younger child and everyone got the chance to talk about their favourite stories and characters. Well done to all the children for dressing up. The children have been very busy today writing their recipes for pancakes. The children then followed their step by step method to make the batter and then fry their pancake. The pancakes were delicious and each child got the chance to cook and add their own toppings to the pancakes. The senior room have been working hard learning all about how to write a letter. This week they each got to write their own letter and post it during school. As you can see from the photos the children absolutely loved getting to post their own hand written letters. This week the Junior room have been learning all about an post and the busy work of a postman/postwoman. The children wrote their letters to Santa Claus and also drew a map just so Santa won’t get lost. The children then went on a trip to the post box to post their own letters to the North Pole just in time for Christmas. The children are learning about the genre of poetry writing and this week they wrote their own Acrostic poems. The children have also been learning about Advent and the meaning behind it. The children read the story ‘The Rainbow Fish’ and learned about the importance of Friendship and sharing with one another. The children also discussed what friends are and words to describe a good friend. The Junior room are getting ready for Halloween and this week they listened to the story of ‘The Bumpy Little Pumpkin’ and then made their own Jack-o-Lanterns. Congratulations to all the children who took part in the ‘Write a Book’ competition and especially to the three winners in Junior Infants, Senior Infants and Second Class who received their awards in Dromoland Inn on Monday 16th of May. The children were practising their procedural writing this week and they wrote up a beautiful recipe for cookies. They were very fortunate to get to put their writing into action and bake cookies in school today. The children learned a lot about cooking, ingredients, weighing and much more. The cookies were delicious. Thursday 3rd of March was World Book Day. The children came in dressed up as their favourite book characters. 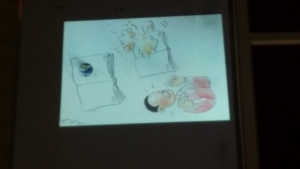 They also got to bring in their favourite books and show them to the class. The children had lots of fun and really enjoyed World Book Day. The children were really busy today making pancakes for ‘Pancake Tuesday’. They had lots of fun writing poetry about pancakes, discussing how you would make pancakes i.e. ingredients, equipment and method. The children did a great job making the pancakes and really enjoyed getting to eat them afterwords. The senior room got the chance to put their procedural writing into action by making Gingerbread Men. They followed the recipe and worked really hard together to make Gingerbread men for everyone to taste just before Christmas time. The girls and boys were busy this week writing Christmas cards and Letters to their friends and close ones. They then stamped and posted them just in time for Christmas. Animals reports by the junior room. The boys and girls in Ms. Bennett’s room have been busy writing their very own reports on the Red Squirrel. They wrote about what it looks like, where it lives, what it eats and what it does! They really tried very hard with their writing. Well done to all. We had two more Word Wizards in the Junior room.Well done! The children in the Junior room are continuing to write recounts. They are all trying their best at their writing. The children are learning lots of new vocabulary with the help from the book ‘Where the Wild Things Are’. We chose two Word wizards to put some of these words into sentences and explain what they meant. The children began their school year by drawing and writing recounts about their Summer holidays and about their news from the weekend. All children made a great effort. The children in Ms. Lee’s have written, edited and then typed their recounts. Come in and view the recounts from Ms. Bennetts and Ms. Lee’s on the literacy board!